CLUED INTO SCHOOL WITH THESE EDUCATIONAL ADVENTURES! Boy, have we been getting our fix of Blue's Clues thanks to the recent release of Blue's Clues: Get Clued Into School Pack, which includes over 4 1/2 hrs. of already aired episodes on 3 DVDs! And, at only $11.99, you can't go wrong for all the fun filled educational collection, which will have Blue teaching your child important life lessons, while having fun, too! Prior to receiving this DVD, my girls had been watching streaming Blue's Clues episodes through on television and kept asking for more. For a short time Savannah took a break from watching Blue's Clues, but after watching a couple episodes with her little sister, Bella, she was hooked again, and has made a point to make Blue's Clues part of her daily allotted television viewing. While some parents may not be fans of the shows, as they think it is corny, I personally like it. My girls have learned so much inlcuding things like the alphabet, counting, colors and shapes and so much more. And, with this 3-DVD collection, your preschooler will be well on their way to being better prepared for school, thanks to part to the "Blue Takes You to School" DVD, which is included in this collection. Savannah will be starting kindergarten in the fall and less anxious and more excited thanks to the fun-filled episodes featuring the oh so lovable Blue. So, join my girls and so many other Blue's Clues fans in picking up this 3-DVD collection to share with your preschooler. And, watch them smile and shout out answers and point to clues that appear on the screen. This really is a fun interactive educational series for little ones, and parents will see them learning and remembering long after the episode is watched. I highly recommend Blue's Clues for parents with preschoolers, and this DVD collection contains some of the best episodes from this hit animated series. "Blue invites fans to jump in and learn shapes, colors and letters in this new DVD featuring everyone’s favorite problem-solving pup! Blue’s Clues: Get Clued Into School Pack takes fans to school for over four and a half hours of educational entertainment. 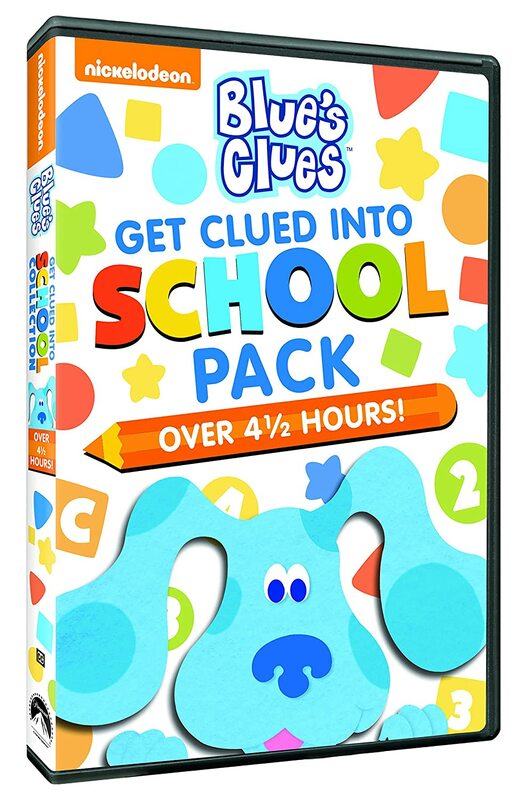 Produced by Nickelodeon Home Entertainment and distributed by Paramount Home Media Distribution, Blue’s Clues: Get Clued Into School Pack will be available on DVD on March 10, 2015 for the suggested retail price of $16.99.